When it comes to classic simplicity, it's hard to beat a traditional French manicure. The classy, white-tipped look moves effortlessly from office to fine restaurant, offering timeless beauty and elegance. The traditional look is also appropriate for special occasions such as weddings. If you're looking for something a bit different, though, there are ways to jazz up the French manicure. If you'd like to keep it simple and elegant, but you're looking for a touch of sparkle, consider adding beads, jewels or rhinestones to your French manicure. Stones with a silver or diamond look are in keeping with the traditional look, but you can use colored beads or stones for a more unusual touch. 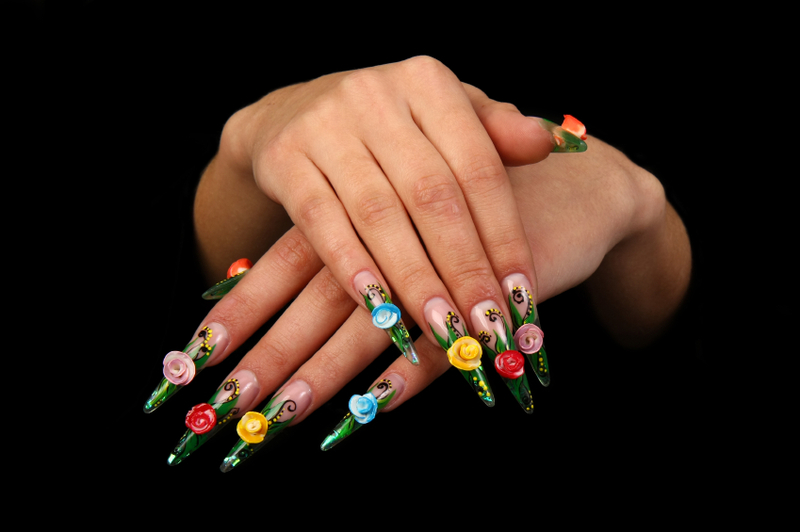 The use of 3-D artwork on nails is a relatively new trend, and it's a fun way to jazz up these classic nails. Opt for pretty pastel flowers for a romantic look or go bright for a bolder style. To avoid an overdone look, confine the artwork to one or two accent nails. While glittery nails are definitely not for everyone, they are fun and youthful. Try red tips with a glittery overcoat and star accents for a festive, patriotic look. Another fun take on glitter that is a bit more sophisticated involves multiple color combinations on your nail tips. Red and gold combine for a festive look, while combos like black and white provide elegant contrast. Although French nails are usually considered fairly conservative, there are many ways to go wild with the style. Try extremely long nails or bold colors such as blue. These nails also make use of an unusual marble design with 3-D artwork and faux gems. The combination probably isn't appropriate for everyday wear, but it's perfect for a holiday party or Mardi Gras. Classic French nails are a soft, feminine style, and pastel flowers only add to that effect. Flowers in soft pink, lavender, blue, coral, or even white accentuate the romantic beauty of this nail style. French nails are anything but boring when you opt for bright colors. These tangerine tips are ideal for a spring picnic or to brighten up a dreary winter day. Keep the polish updated and free of chips for a neat, well-groomed appearance. A black and silver combination says elegance without even trying. Start with a basic French manicure with black tips, and then top your nails with a simple design in silver glitter. This look is perfect for a night on the town or a holiday party. You can get a similar impact with other color combinations, such as red nails with gold glitter or pale blue nails with silver accents. A French manicure with rounded nail tips looks youthful and neat. If your nail beds are small and round, rounded tips will look natural even if you go with acrylics. Give the illusion of longer nails by making the white tips a little lower than normal, and use an emery board to get a smooth, round edge. Create a noticeable look by painting white flowers or butterflies on your fingernails. You can keep the designs as simple as you like, and your nails will still look elegant. After you get your basic French manicure, ask your nail technician for some airbrushed artwork. The spray artwork should blend nicely with the nail beds and tips. Choose interesting colors that won't overshadow the pink completely. French nails don't have to be long or fancy to be beautiful. Short, red tips create a flirty and low-maintence look that can go from office to night out. Add simple white designs for added contrast and drama.